Last Sunday myself and a few Internet types was invited by Blink PR up to Kippure Estate for a morning of adventure activities. They’re promoting The Adventure Weekend which takes place from the 20th to the 22nd of May (next weekend) in the RDS. After getting safety harnesses and helmets sorted out, the 14 of us were split into two groups taking on different activities first. Our group got the big swing first. Thirty three feet up on a platform, you lean back off the edge with your weight on a pin controlled rope. Four ropes loop under the platform and onto you and when you’ve given the OK, the pin is pulled and you drop and swing beneath. The second or so when the pin is pulled is breathtaking whilst the ropes take your weight and you start to swing (that’s Christian Hughes in the pic btw). The second activity of the day was the Balance Beams. They’re solid wood beams at twenty and thirty feet up that you walk across and from the ground, don’t look like much. You’re roped up safely to the instructor but on a windy day, it’s tough enough to stay on. 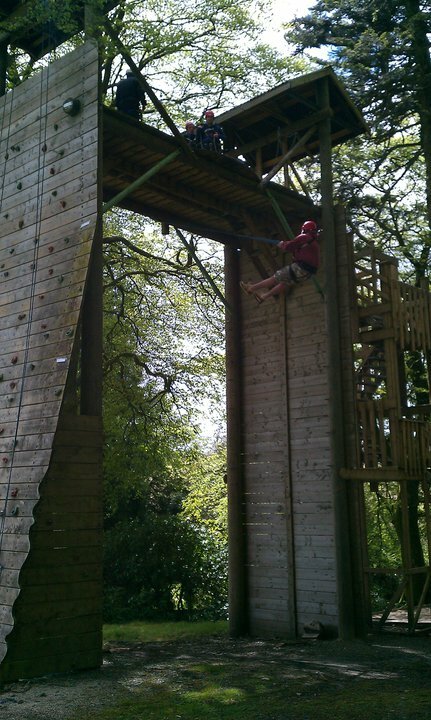 Our last activity was the Leap of Faith. You climb up a wooden beam and onto a platform to leap onto a trapeze. Well, that’s the aim anyway. I made the trapeze but my hands slipped on the wet metal. Joerg was the only one amongst our group who did it so fair play to him. Afterwards we enjoyed some fish and chips for lunch and shared stories of which ones we completed. Thanks to Kippure for having us. Tickets are €15 each (€40 for a family of 2 Adults + 3 kids under 16) with some of the bigger interactive stuff costing an additional €3 to €10 (see here for details). I’m hoping to catch the event on the Sunday as I’m down in Cork at a wedding on Fri/Sat. I’d definitely recommend you go as there’s a lot on offer for the price. Great Post, McG. I’d love to give the Monster Swing a whirl again; I was so nervous last Sunday, I don’t think I fully appreciated or enjoyed it. Defo going back to Kippure. Definitely going to be back to Kippure alright. Would like to fit in some hiking too.